F-One have been a ‘one kite does it all brand for some time now, and the bandit has been a huge success for them. However, over the last couple of years they have been working on a few new gems for us all. We saw the Diablo foil kite which had been a huge success among foilers and racers across the globe. Yet they know a foil kite isn’t for everyone, so now the team at F-One bring us this new offering. The BREEZE is a one-strut Delta C-shape kite. It’s been created to be as light as possible giving the riders the ability to get out in the lightest winds (and now you begin to understand the name…). Something that has always been hard when foilboarding is having an LEI that will fly in the lightest winds you can foil in. The BREEZE aims to bridge this gap. 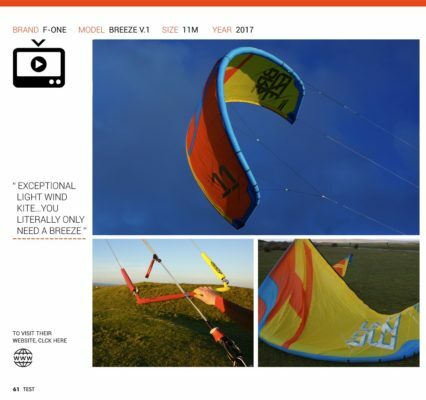 The kite isn’t just for foiling though, it’s also aimed at all riders wanting a good light wind kite for freeriding too. The BREEZE has a new bridle with 4 fixing points and 3 pulleys on each side, is built with D2 Technoforce ripstop and has plenty of reinforcements. It looks incredibly robust for a light wind kite. The BREEZE comes in three color ways: yellow/orange, yellow/green and blue/orange. We have the 11m model on test, but it is available in three sizes. The Monolith bar from F-One looks like a piece of art. The red and yellow colors are combined with its CNC 6061 Aluminum frame and anti-slip thermoformed double EVA Layered grip making it a tough one to beat. Featuring a Y split configuration further up the lines with a swivel, action below the bar is kept tidy and just includes the safety release needed. The safety release is easy to use (it’s a push-away style) and is very easy to reconnect. The leash options are either standard safety or the suicide leash attachment mode for unhooked moves. The plastic-coated center line reduces friction and wear and is more comfortable on your fingers, this also gives the kite a more responsive feel through the bar when turning too. This center line extends up to meet the clam cleat depower set up which is easy to use, reach and looks very tidy. The Bar is available in two sizes: 45 and 52cm. We managed to launch this kite in 6-10mph of wind, which isn’t a lot by anyone’s standards! Yes, it needed moving around slightly to keep it up there, but wow we were impressed! The BREEZE is insane, as it says on the tin you literally only need a breeze to fly this kite. Doubtful that a foiling session was even on the cards in this wind with a LEI we were running out to blast around the glassy waters. The stability was fantastic in those light winds and as the wind increased the stability improved even further. This kite certainly gives you confidence when flying. The BREEZE is very fast in the sky, somewhat pivotal in its turns. The pressure on the bar is light and the feedback from the kite is huge, you always know where it is and never have to worry. Looping the BREEZE is never going to make you win King Of The Air, but when foiling it is pivotal and smooth, there isn’t a surge of power that wants to chuck you off your board, it just follows you into your turns. The kite has a great high wind capability with loads of depower, however its forward drive is not huge, it very much gets you going and keeps you going at a perfect pace. It sits a little further back in the window offering plenty of low-end power. If you’re looking to get out freeriding on your foilboard or twin tip this kite is awesome. Jumping on the BREEZE, well you’re not going to top WOO charts, but it still performs adequately. It’s perfectly suitable for some flowing moves and for those who want a smooth ride. Relaunch is very good for a one-strut kite too. An exceptional light wind kite. Ridiculously stable in barely any wind, fast responsive turning and it is likely to puzzle other kites when their LEI’s won’t fly! No Major downsides with the BREEZE, we thoroughly enjoyed flying it! With the BANDIT being such a success for F-One we were keen to see what the BREEZE has in store. This kite completely blew our minds! It flew in barely any wind and performed incredibly well. Foilboarding on the BREEZE was so flowing and felt so easy, the power delivery from the BREEZE for foiling is ideal. Riding on a twin tip was smooth, user friendly and doable in light conditions. This kite should be on your radar if you’re a freeride, foiling fanatic. Likewise, if you’re a school or are at the learning stages then this kite flies in anything and is well worth a look. Lear more about the 2017 BREEZE V.1 Kite!